A Different Drum, the electronic pop shop, recently began a monthly VIP CD series which features exclusive content never before pressed to disc to an exclusive pool of just 200 subscribers worldwide. The December 2010 issue is 14 tracks of the best 2010 Haberdashery Remixes. A limited number of these collectible discs are available here. 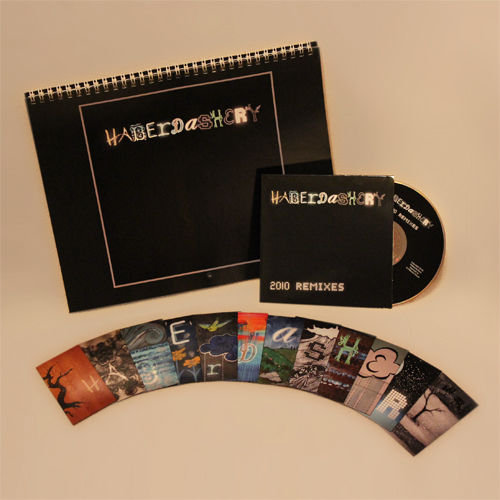 "Haberdashery is emerging from the underground as a synthpop act to follow. Playing a blend of danceable electronic with romantic sentiments, Haberdashery's music reminds listeners of classic Erasure. This is a collection of favorite remixes from several digital EP's released during 2010, pulled together on a limited edition CD release." Includes CD, 2011 Calendar, and a set of 12 magnets featuring artwork from the 2010 EP Series.